Twickenham Stadium is rightly venerated as the home of the Rugby Football Union (RFU). While it may bask in this fame, the stadium's beginnings were very humble. The land it was built upon was purchased in 1907 and would subsequently become the home to the Harlequins who would play the first ever match against Richmond. The first England test match didn't take place until 1910 and a home win ensured things got off on the right footing but cows, sheep and horses would be grazing on the pitch just four years later as the stadium became a farm during the First World War. The first Varsity match was played in December 1921, by which time the popularity of Twickenham had soared. Extra accommodation was created in the North Stand, built in 1925 by the legendary football stadium architect, Archibald Leitch. By 1931, the famous 'Twickenham Look' had come about. When the Second World War arrived, the ground became a Civil Defence depot, and the closest it got to being hit by enemy action was in July 1944 when a V1 flying bomb fell in the front garden of a house opposite the West Gate, injuring sixteen people. The car park was dug up and - appropriately given its original use - turned into allotments to generate much needed fresh food for the locals. The stadium today is at the heart of a multi-million pound business that the RFU controls, but how does it generate so much money from this one plot of land? 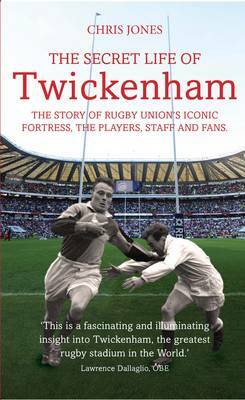 With such a colourful and celebrated history The Secret Life of Twickenham will dig deeper into it's history to reveal the many men and women, cutting across all social backgrounds, jobs, and positions within the RFU who have helped to build this iconic stadium into a globally recognised brand. It will reveal to all fans of rugby union the true history of the most iconic sports stadium in the British Isles with a compendium of facts, dates, figures and revealing anecdotes of England's sporting fortress.